The Richard Bland College website provides extensive information about the College, campus policies, and academic programs. The College Catalog, Student and Faculty Handbooks, course schedules, and the Admission Application are among the publications posted on the College website. Please consult the Richard Bland College website for additional information on any topic listed in this Catalog. The College sends out notification to students when the College is closed through the RBC Alert System. Students must sign up for this service to receive notification. Closings and announcements are also posted on the RBC website and announced through local media and news outlets. The Family Educational Rights and Privacy Act of 1974 is a Federal law, which states (a) that a written institutional policy must be established and (b) that a statement of adopted procedures covering the privacy rights of students be made available. All these exceptions are permitted under the Act. Students may withhold directory information by notifying the Director of Records and Registration in writing within two weeks after the first day of class for each term. The law provides a student the right to inspect and review information contained in his/her education record, to challenge the contents of the education record, and to have a hearing if the outcome of the challenge is unsatisfactory. The student may submit explanatory statements for inclusion in the files if the student feels the decision of the hearing panel to be unacceptable. The Director of Records and Registration at Richard Bland College has been designated by the institution as the individual responsible for coordinating the inspection and review procedures for student educational records. These records include admissions, personal, academic, and financial files, as well as academic and placement records. Students wishing to review their education records must make written requests to the Director of Records and Registration listing the item or items of interest. Only records covered by the Act will be made available within forty- five days of the request. Students may have copies made of their records upon receipt by RBC of $0.15 per page within certain exceptions (e.g., copy of the academic record for which a financial hold exists, or a transcript of an original or source document that exists elsewhere). Education records do not include records of instructional, administrative, and educational personnel who are the sole possession of the maker and are not accessible or revealed to any individual except a temporary substitute, records of the law enforcement unit, student health records, employment records, or alumni records. Physicians designated by the student may review health records. In such cases, the institution will permit access only to that part of the record that pertains to the inquiring student. A student who believes an educational record contains information that is inaccurate or misleading or is otherwise in violation of privacy or other rights may discuss the problem informally with the Director of Records and Registration. If the Director of Records and Registration agrees with the student’s request, the appropriate record will be amended. If not, the student will be notified within a reasonable period of time that the record will not be amended, and the student will be informed by the Director of Records and Registration of the right to a formal hearing. A student request for a formal hearing must be made in writing to the Dean of Faculty who, within a reasonable period of time after receiving such request, will inform the student of the date, place, and the time of the hearing. A student may present evidence relevant to the issues raised and may be assisted or represented at the hearing by one or more persons of their choice, including attorneys at the student’s expense. The hearing panel that will adjudicate such challenges will be the Provost, the Dean of Enrollment Services, and the Chair of the Student Affairs Committee. The decision of the hearing panel will be final, and will be based solely on the evidence presented at the hearing. Notification will consist of written statements summarizing the evidence and stating the reasons for the decisions. The decision will be delivered to all parties concerned. Education records will be corrected or amended in accordance with the decision of the hearing panel if the decision is in favor of the student. If the decision is unsatisfactory to the student, the student may place in the education records statements commenting on the information in the records, or statements setting forth any reasons for disagreeing with the decision of the hearing panel. The statements will be maintained as part of the student’s record and released whenever the record in question is disclosed. Students who believe the adjudication of their challenges was unfair or not in keeping with the provisions of the Act may submit written requests to the President of the College for assistance. Students who believe their rights have been abridged may also file complaints with U.S. Department of Education, Family Policy Compliance Office, 400 Maryland Ave., S.W., Washington, DC 20202-8520, concerning the alleged failures of Richard Bland College to comply with the Act. Revisions and clarifications will be published as experience with the law and institution’s policy warrants. Copies of the College’s policy and procedures are available to students (and authorized parents of students) upon request at the Office of Records & Registration. The Richard Bland College campus consists of over 800 acres of land, 16 buildings totaling nearly 345,000 gross square feet. The East Campus in Prince George County is notable for its signature pecan grove and the historic, white-washed buildings that supported a dairy farm until the early 1900s, and later a state hospital. Today, in addition to the Asian Water Garden and Barn Theater, campus services and administration occupy the East Campus. 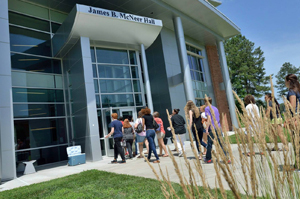 The West Campus in Dinwiddie County is the center of student and academic life. In addition to the library and academic buildings, athletic and recreation facilities and residence halls are located on the West Campus. First Floor: Gymnasium, Statesmen Athletic Department offices. A vestige of the dairy farm that previously operated on the site, The Barn Theater is a multi-purpose facility that provides a unique backdrop for lectures, live performances, and events. Because of its versatility, abundant natural light and flexible, open space, the Barn Theater is a popular venue for retreats, workshops, conferences, weddings, and other sponsored events. Prior to the establishment of Richard Bland College in 1960, the President’s House was one of two farmhouses built by the Hatcher Seward Family, who operated a dairy and cattle farm in the early 1900s. The house is nestled amongst the College’s pecan groves and Asian Water Garden. The two-story home was remodeled in the 1960s, and a distinct room for entertaining was added to the house in 1996. The room’s large glass windows give presidential guests an expansive, breathtaking view of the Asian Water Garden. A fountain with a statue of Hebe, carrier of the Torch of Youth in Greek Mythology, a gazebo, and guest house are also present on the grounds. Initiated by former President Clarence Maze, Jr., in 1988, the College’s Asian Water Garden was inspired by Claude Monet’s Gardens in France. The garden was fully developed five years later in 1993 and is open to the public throughout the year. A quarter of the one-acre garden is underwater. There are two waterfalls, two Japanese- style bridges, a pier, a garden path, benches and a cupola. Lotus, Iris, Cattails, Clover, Papyrus, Plantain, and Thalia are just a few of the water plants. Shrubs, bog plants, and beds of Daylilies, Peonies, Black-Eyed Susans, Iris, and numerous others surround the pond. Pecan, Japanese Maples, Cherry, Maple, and Dogwood Trees encase the garden.